This syrup combines two powerful infection fighters, raw honey and elderberry extract. is used in preparing elderberry syrup not only to improve flavor but to confer many health benefits  . Take the recommended dose 4 times a day. In a saucepan, add water, dried berries and spices. If using essential oils, do not add them until step 6. Slowly bring to a gentle boil, then reduce heat and simmer on low for 45 minutes, or until the volume has reduced approximately 50%. Using a spoon, mash the berries against the side of the pan to release as much juice as possible. Strain out the berries, mashing them in the strainer with the back of a wooden spoon to get as much juice as possible. Stir in raw honey and essential oils. An immersion blender can be used to incorporate the honey into the cooled berry mixture. Pour into Glass Bottles using a funnel. Label with instructions and date of preparation. Store in the refrigerator up to 4-6 months. 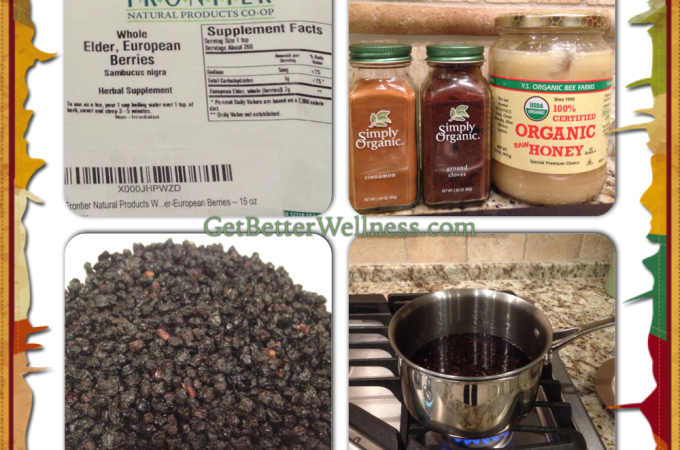 Elderberry Syrup needs to be in your natural medicine chest. I use a variety of natural remedies to combat the nasties. I no longer need to use toxic over-the-counter medication. Here’s what is in my natural medicine to raise our wellness line, especially during winter. Eucalyptus globulus essential oil – great for respiratory support. Rub on the bottoms of the feet, or diffuse/inhale. For more tips be sure to see my post, How to Stay Healthy and Deal with the Common Cold. Özgen, Mustafa et al. “Total Phenolic, Anthocyanin Contents and Antioxidant Capacity of Selected Elderberry (Sambucus Canadensis L.) Accessions.” Pharmacognosy Magazine 6.23 (2010): 198–203. PMC. Web. 11 Dec. 2014. Krawitz, Christian et al. “Inhibitory Activity of a Standardized Elderberry Liquid Extract Against Clinically-Relevant Human Respiratory Bacterial Pathogens and Influenza A and B Viruses.” BMC Complementary and Alternative Medicine 11 (2011): 16. PMC. Web. 11 Dec. 2014. Ajibola, Abdulwahid, Joseph P Chamunorwa, and Kennedy H Erlwanger. “Nutraceutical Values of Natural Honey and Its Contribution to Human Health and Wealth.” Nutrition & Metabolism 9 (2012): 61. PMC. Web. 11 Dec. 2014. Othman, Nor Hayati. “Honey and Cancer: Sustainable Inverse Relationship Particularly for Developing Nations—A Review.” Evidence-based Complementary and Alternative Medicine : eCAM 2012 (2012): 410406. PMC. Web. 11 Dec. 2014. Zakay-Rones, Z, et al. “Study of the Efficacy and Safety of Oral Elderberry Extract in the Treatment of Influenza A and B Virus Infections.” The Journal of International Medical Research, (2004) 32: 132 – 140.